Sleep problems in children can lead to health and behavioral consequences down the road. Is your child snoring? It’s one of the many symptoms of sleep problems in children. Sleep apnea in kids is more common than you might thank. Thankfully, there are natural ways to get your child back to a regular sleeping pattern. In order to successfully treat sleep problems in children, it’s important to know how much sleep your child needs. 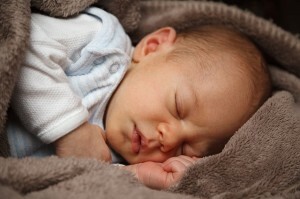 From birth to 24 months of age, your child needs to sleep thirteen to seventeen hours a day. Toddlers require nine to thirteen hours. Children aged 4 to 12 need about ten to eleven hours of sleep each night while teenagers need about 9-10. Is your child getting all the sleep she needs? To treat child sleeping problems, it’s important to get to the bottom of the cause. Distractions – Is your child watching TV, texting or playing computer games before falling asleep? This could lead to sleep deprivation. Also, how quiet is your child’s sleep environment? Siblings, pets, and noisy neighbors can all contribute to poor sleep. Medications – Medications for ADHD can sometimes cause insomnia in children. Caffeine – Children under the age of twelve should never drink caffeine as it disrupts the natural sleep cycle. Medical problems – Asthma, allergies, digestive disorders, autism, bi-polar disorder, and thyroid disease can all contribute to insomnia in children. Parasomnias – Nightmares, night terrors, sleepwalking, sleep paralysis, teeth grinding, bed wetting, and movement disorders are common sleep problems in children. Child snoring can be caused by frequent colds, chronic allergies, enlarged adenoids and tonsils or sleep apnea. Sleep apnea can be very dangerous for young children and it’s usually caused by obesity, enlarged adenoids, and allergies. Children with sleep apnea can be treated by sleeping on their sides or sleeping propped up. Using an antihistamine and saline nasal spray can be used to address allergies. If enlarged adenoids or tonsils are causing the problem, your pediatrician may suggest removing them. Sleep problems in children can be difficult to detect since they mimic so many other disorders. Check up on your child for the next couple of nights to see if he or she appears to be sleeping soundly. If not, there are plenty of ways to treat child snoring and other sleep-related issues naturally.